For AngularJs documentation go to: Angular documentation. 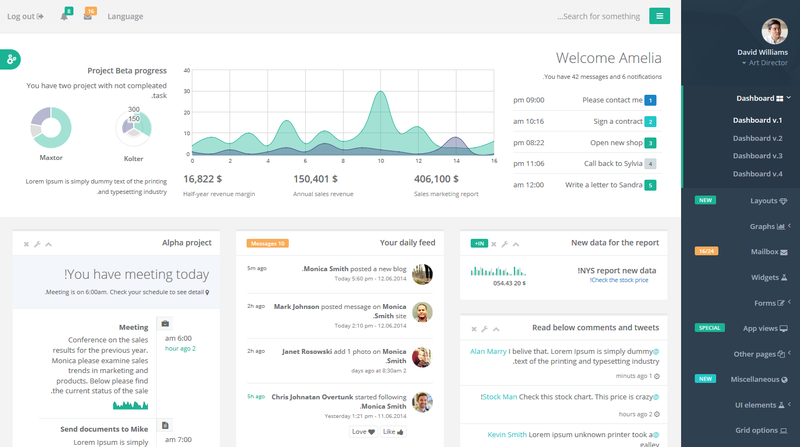 INSPINIA has a clean and minimalistic design which helps you create an awesome and powerful project. It is perfectly designed and precisely prepared. Template was built based on the latest standards and recommendations. 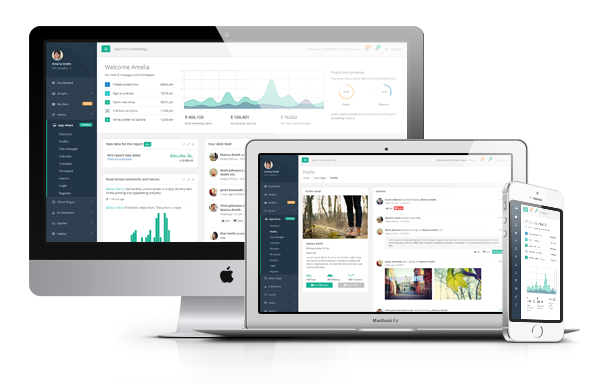 INSPINIA theme is powered by Twitter Bootstrap v3 - the most popular front-end framework. Please note that this documentation is dedicated to the main element of the template. With each version, we will try to develop it. But if you have any questions going beyond what is described here don't hesitate to write to us. #wrapper main container of body elements. nav .navbar-static-side left navigation menu. #page-wrapper main container for page elements. nav .navbar-static-top top navigation with second menu. 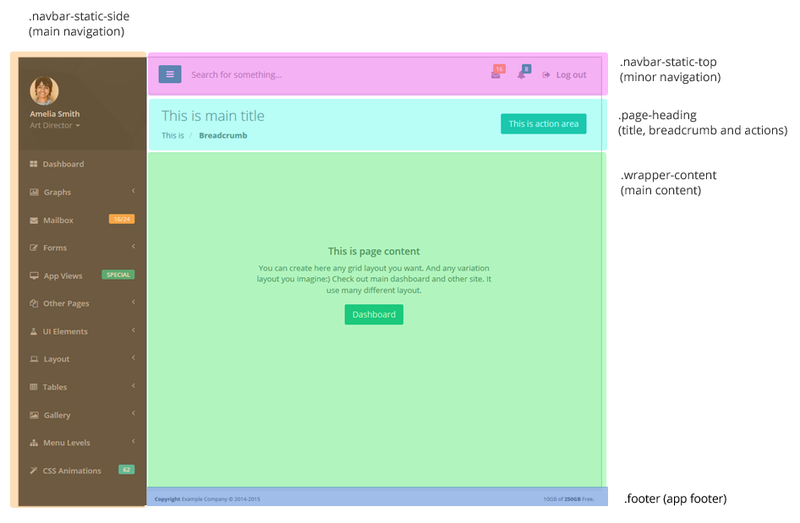 .wrapper-content main container for html elements. .footer main container for footer. Page <head /> contains Metadata, CSS files. Navigation menu with profile submenu. Menu for notifications and primary functions such as logout or global search. Main content wrapper with page heading and page content. To use layout 2 all you need to do remove full nav element (sidebar navigation). Add .top-navigation class to body element and add .container class with element after .wrapper class element. Please chcek teh example file Dashboard_4.html to see code of it. And in navigation after element with class .sidebar-collapse add special element to handle hide menu. 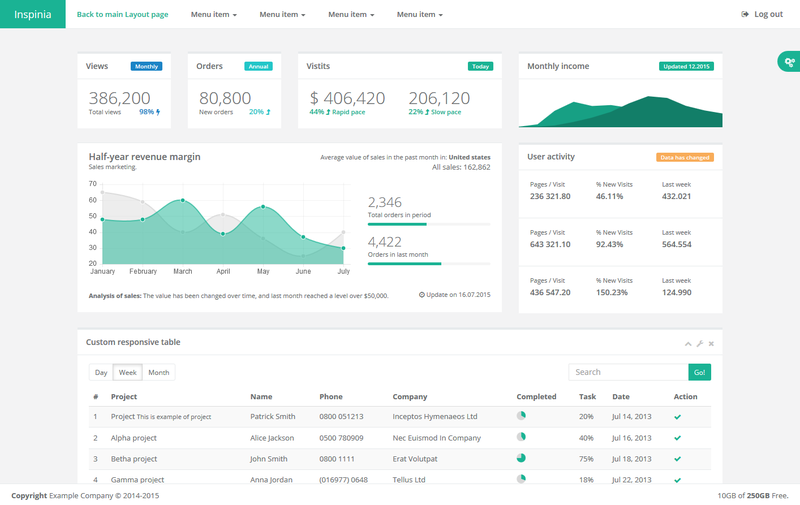 It is an application skeleton for a typical web app. You can use it to quickly bootstrap your webapp projects. It has all necessary resources/files to help you started new project. As your project will grow you will need to add new resources. Look at the full version to select the elements and resources you want to use. Please stay tuned for 2.2 version to get new features for HTML/JS version. faq.html - Fix the collapse effect - Create new div element .faq-answer before p answer. Please stay tuned for 2.0 version to get new features.